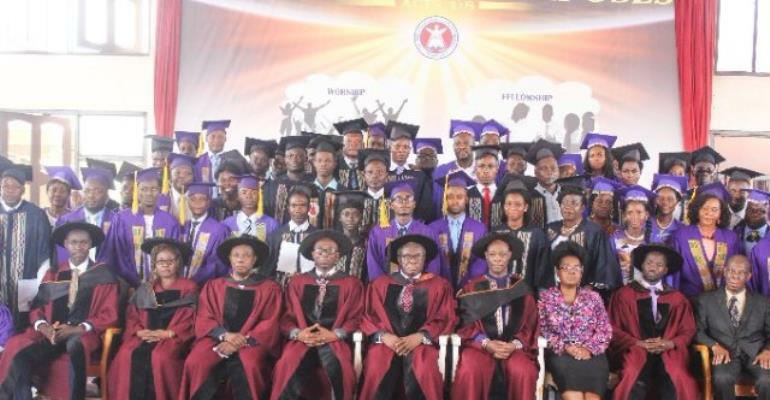 The Principal of the Christian Leadership Bible Training Institute (CLBTI) has urged the school's new graduates to “be true disciples of Christ”. In an address, Apostle Richard Buafor who is also the General Overseer of The Lord’s Pentecostal Church International, charged them to provide the Christ-type of leadership to their families, churches and communities. He was speaking when the Institute's held its 12th graduation ceremony at its Accra campus, on the premises of The Lord’s Pentecostal Church International, Kwashieman. In all, 103 graduates were presented with diplomas and other certificates after going through two years of holistic training in ministry. Apostle Buafor tasked the graduands to go back and assist pastors in various branches of the church and make use of the knowledge they have acquired in the school by practising the things they were taught. The guest speaker, Bishop Charlton Oliver Patterson, General Overseer of the Lighthouse Church of God, London, encouraged the graduates to take their inspiration from the scriptures and rely on the bible as their only guide. The Dean of Faculty, Apostle Daniel Quarshie, presented a report on how well the institute had fared since its humble beginnings in 1990. Apostle Quarshie said that the Institute now offers degree, diploma and certificate programmes in various aspects of ministry, to pastors, elders, deacons, deaconesses and youth leaders. The 2018 graduating class comprised of 79 males and 24 females. “We have so far produced over 400 graduates since we begun in 1990,” he said. According to him, the institute had now decentralised its causes with satellite branches opened in over 14 branches of the Church. The institute, which is an affiliate of the Vision University and the New Covenant Theological University in the U.S. was established in 1990 by The Lord’s Pentecostal Church International. It was to train and equip people for ministry.